Prizes to be won daily! Use the free game code JHLQNR779HK or you can text message AlwaysSummer to 24455. This ends on 8 September 2015. (49) Grand Prizes (7 per Daily Entry Period)—Corona Coleman Stainless Steel Cooler ($95 ea.). (2,800) First Prizes (400 per Daily Entry Period)—Corona Wayfarer Bottle Opener Sunglasses ($9.99 ea.). (49) Grand Prizes (7 per Daily Entry Period)—Bean Bag Toss and KanJam Lawn Games ($104.98 per prize). (49) Grand Prizes (7 per Daily Entry Period)—Weber Q Portable Grill ($159 per prize). (2,800) First Prizes (400 per Daily Entry Period)—Corona Koozie ($5.99 ea.). (49) Grand Prizes (7 per Daily Entry Period)—$200 StubHub! Electronic Gift Card. (49) Grand Prizes (7 per Daily Entry Period)—Ellison Luxury Sunglasses ($165 ea.). (2,800) First Prizes (400 per Daily Entry Period)—Corona T-shirt (size XL only) ($14.99 ea.). (49) Grand Prizes (7 per Daily Entry Period)—Polaroid Cube HD Action Video Camera ($99.99 per prize). (49) Grand Prizes (7 per Daily Entry Period)—NUU Splash Extreme Waterproof Bluetooth Speaker ($99.99 ea.). 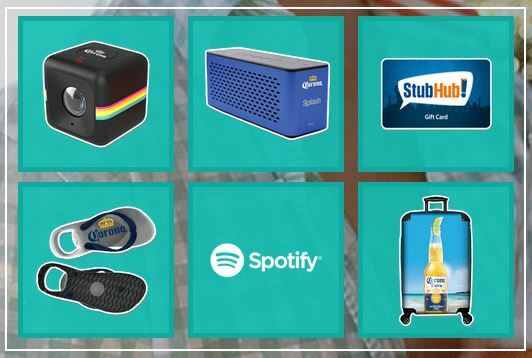 (2,800) First Prizes (400 per Daily Entry Period)—Corona Flip-Flop Bottle Opener ($4.99 ea.). (49) Grand Prizes (7 per Daily Entry Period)—Corona Beach Prize Pack consisting of Mophie Juice Pack Powerstation Portable USB Charger and Beach Bag ($119.98 per prize pack). (49) Grand Prizes (7 per Daily Entry Period)—Corona Spinner Upright Suitcase ($175 ea.). (49) Grand Prizes (7 per Daily Entry Period)—Portable Hammock ($79.95 ea.). (49) Grand Prizes (7 per Daily Entry Period)—One-Year Spotify Premium Subscription Electronic Gift Card ($119.88 ea.). (49) Grand Prizes (7 per Daily Entry Period)—Corona Outdoor Fire Pit ($225 ea.). Click here to go to Corona USA website to find out more.